In 1959, an atheist, single mother chocolatier opens a chocolatierie in a repressed French village at the beginning of Lent. The titular film character, Forrest Gump (1994) said life is like a box of chocolates you never know what you going to get. This a feeling of apprehension we may have when about to watch a new movie. A feeling which I had admittedly with this film, however in retrospect, I almost missed out on a good thing. This film, Chocolat (2000) was one my Darlin’ Husband had recommended and I had avoided mainly for two reasons. Firstly, before this as not the biggest (or indeed smallest) Johnny Depp film lover, apart from Ed Wood (1994) – but that’s another story – as I can only see him as 2003’s Pirates of the Caribbean‘s Captain Jack Sparrow. I’d also avoided it as was under the misunderstanding after reading the title that this was a French-speaking film. And along with the mention of the leading lady, Juliette Binoche, every time it has been suggested, I’ve not been in the mood for subtitles. So in watching it I was happy to see the lack of subtitles and the cast including British National Treasures Judi Dench and Alfred Molina. And I assume Swedish National Treasures Lena Olin and Peter Stormare. And Canadian, Carrie-Anne Moss. The film has a lovely chocolate box feel to the start as we zoom in on Lansquenet-sous-Tannes, a wee made-up, picturesque French village and very twee it is too. It has a wee church and lovely old buildings setting the scene for the film set in 1959 just before the beginning of Lent. The film storyline is told by a grown up Anouk, daughter of Vianne Rocher (Binoche) telling of the village and its inhabitants’ conservative, God-worshipping mores. We meet the main characters as they attend church greeted by the Comte de Reynaud (Molina). He is a deeply religious man giving up vehemently sweet things for Lent, and whose wife has not yet returned from a prolonged Italian trip. These characters are revealed to be a six-year-old, Anouk (Victoire Thivisol, but voiced by Sally Taylor-Isherwood) and her mother Vianne Rocher (Binoche). Vianne hopes to rent one of the shops in the village which she does though the often grumpy, Armande (Dench). Armande does not believe in God and therefore does not attend the church services. Vianne is welcomed to the church by Comte, however she politely declines as she does not believe in God. Daughter Anouk has an imaginary friend, a kangaroo named Pantoufle. Coupled with Vianne being a single mum, the Comte is disturbed by these new presences in the town, who dismiss Vianne as a “radical”. The Rochers’ shop is lovingly painted and decorated with trinkets from all over the world. A yummy looking montage reveals the mystery of the shop’s purpose as a chocolaterie is revealed.. with it’s opening timing at the beginning of Lent adding to the Comte’s concerns. Slowly we meet the churchgoers who come into the shop, all warming to the owner through sharing their thoughts on a spinning plate. After which Vianne reveals a chocolate – often with a hint of mystic powers through using chili – that reveals their inner desires and the potential for meeting these needs. However as it is Lent, there’s only a few customers. Mme Marceau (Elisabeth Commelin) shares that her husband is no longer amorous, but after she eats one chocolate and buys him a bag only to find him sleeping she is disheartened. That is until he finds the bag she threw away.. .
Landlady Armande shares that her relationship with her daughter is rocky and she hasn’t been able to spend time with her young grandson, Luc. Its revealed her daughter Caroline Clairmont (Moss) is a widow who works as a secretary for the Comte, and she overprotects her son, Luc (Aurélien Parent-Koenig). Luc has a flair for sketching often macabre pictures of people. Caroline scolded him for entering the chocolate shop before, and for nearly eating the chocolate cake offered by the Rochers. Her mother however often drinks hot chocolate there and is openly reprimanded by her daughter. Caroline is concerned about this as she feels her mother can’t look after herself as her mother is revealed to have diabetes. However, unbeknownst to her, Luc spends time with his grandmother after Vianne asks him to sketch her a portrait.. with the boy eating a small piece from a cake portion. Other members of the village we meet include Guillaume Blerot (John Wood) and his pet dog, Blerot is harbouring romantic feelings for the long time widow Madame Audel (Leslie Caron). He is shy about revealing his feelings, but their relationship is furthered after his dog eats a chocolate. And an opportunist thief, Josephine (Olin) who after secretly stealing her favourite chocolates, later meets and trusts Vianne. This comes after Vianne brings her some chocolates to initiate a friendship with her. Vianne is concerned about her as it’s revealed she is being beaten by her husband Serge (Stormare). However after eating the chocolate she has the strength to leave him… as she moves in to the chocolaterie as Vianne’s apprentice. This film had a lovely feeling from the start with its haunting musical score, the tranquility of the idyllic setting and magical script. These attributes, along with the narration – starting with that almost fairytale use of the phrase, Once upon a time added to the ethereal and beauty of this unique tale. The setting filmed in a hybrid of an English towns river combined with a French village added to the charming ambience. The casting was just as refreshing with Binoche really the only actress you could see in this role. With a supporting cast which were almost tailor-made for this film all believable with special mention to Dench, Stormare and Olin. The youngest members of the cast, Victoire Thivisol and Aurélien Parent-Koenig complimented these big name stars perfectly. It was only marred by Depp who although his presence was welcoming his Irish accent was more Brad Pitt /Tom Cruise than Liam Neeson. It was interesting to have the story as told by the lead character’s daughter, as a grown up adding a personal touch to the story. The story like a chocolate box had both light and darker moments. And the inclusion of the narration and the characters and the villagers and the Rochers’ origins stories complemented rather than detracted from the movie. The character arcs of the characters were lovingly written for some, and more disturbingly for others. Yet the characters in these respective roles made you feel empathy for them – even with the latter – and the situations they found themselves in. The story arc for Olin’s character Josephine was the most striking as she initially was a mousy, timid, loner with a penchant for thieving. Olin making this vulnerable character in an overwhelming situation transform into a more confident, open and trusting person with the villagers. There are many love stories initiated in the movie, and realistically and touchingly told despite the fairytale storyline. The most significant being the maternal love that Vianne feels for her daughter and that Armande has for her grandson. There is romantic love too. And there is chocolate. The eating of this chocolate often revealing the characters motivations and often leading to the eater’s desired outcomes. These wishes not often voiced, but sometimes more apparent as the characters’ stories progressed. There is of course chocolate in lots of lovely mouth-watering shots so do try to avoid this film if you are on a diet or even Lent. But finally, accept those lines as Johnny Depp makes his appearance as Roux and not as Anouk calls him a “kind of pirate” and “the Captain”. I stress his role has nothing to do with Captain Jack Sparrow. But instead enjoy the sweet performances from Depp and the cast. This feel-good film really is box of delights, which like the subject of the film title that makes you feel all gooey inside. 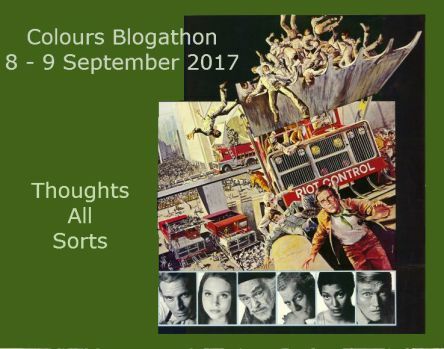 This review was entered for the Colours Blogathon run by Thoughts All Sorts. Other reviews with this cast include Judi Dench in Spectre, Lena Olin in Welcome to Sweden and Johnny Depp in Ed Wood reviewed both as an individual film and when remembering Martin Landau. Peter Stormare features in my John Wick Chapter 2 and Fargo reviews. I love this film so much! Beautiful, moving and so gorgeous to look at. It also always makes me crave some chocolate so bad. I tell you what, if Vianne ever moved to my town and opened her shop, I would be in there all the time buying chocolates and drinking her homemade hot chocolate. So many likeable characters in this. I think Lena, Alfred, Judi and Juliette deliver superb performances in this. So agree, it is a lovely movie with wonderful performances. Does make you crave chocolate as you say! This is such a heart-warming film. I have many favourite scenes here, including the one where Depp’s character rescues Vianne from the water, the latter thinking her daughter has been caught up in the fire on the boat. Inspirational and moving in every respect. If you liked the film, I also recommend reading the book. Thanks, not read it. Will certainly look into it! I love this film so much! Juliette Binoche is one of my favorite actresses in the world, and it was great to also see Dench and Molina – they are great! I recommend it to everybody! Thanks, it’s such a lovely film I wish I’d seen it sooner. Thanks Katrina, always great to get your comments. I used to enjoy most of Johnny Depp’s roles pre-Pirates franchise…since then…he’s just Captain Jack to me…in any role he takes on. Loved him in What’s Eating Gilbert Grape. Blow is also good. Finding Neverland is wonderful too.